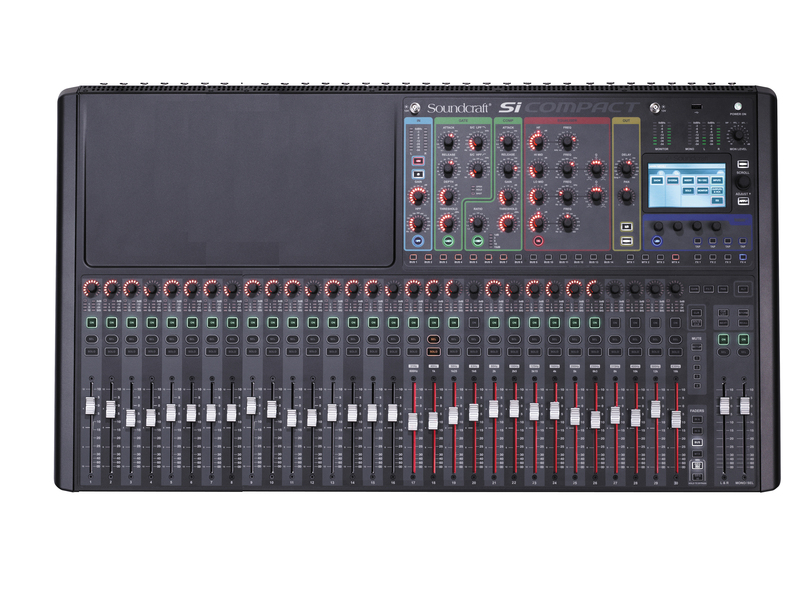 Drawing on the heritage of Soundcraft's acclaimed Si Series digital live sound mixers, the Si Compact packs powerful digital mixing facilities along with stunning Lexicon® effects into a small footprint console. All this and more without compromising a powerful feature set. The Si Compact 32 feature 32 recallable mic pre amps plus 4 stereo returns, AES in and 64 input option slot with a capacity to combine up to 40 of these inputs to mix; each input is 'fully equipped' with compressors, gates, parametric EQ, High Pass Filter and delay. All Si Compact consoles have buses and output processing to match the versatility of the inputs; all aux/group, master and matrix buses feature a compressor, parametric EQ, graphic EQ and delay always available all of the time. To complement the channel and bus processing all Si Compact consoles offer four Stereo Lexicon FX processors providing a wealth of sounds and user adjustable parameters; alongside the 21 graphic EQs that's a total of 25 processes that can all be used at the same time in addition to all the regular channel and bus processing. Flexible onboard and expansion I/O options ensure the Si Compact integrates effortlessly with other system components; along with the 32 mic inputs there are two pairs of stereo analogue line in, AES in and out, 16 analogue line outputs, headphone monitor out and a 64x64 channel expansion card slot capable of utilising any of the Si series option cards that includes AES, AVIOM, CobraNet and MADI. 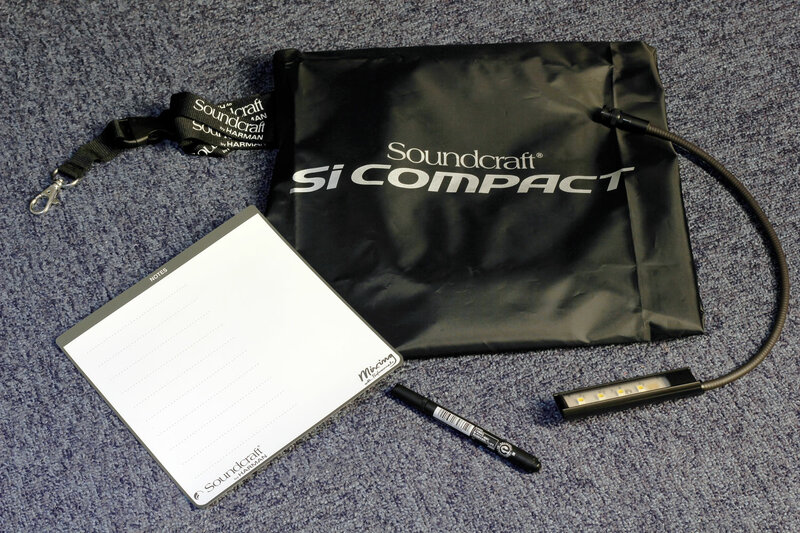 The MADI card, as well as being an interface to multi-track recording systems enables linking the Si Compact to the Soundcraft/Studer stageboxes which extend the I/O power and flexibility; but all this power is nothing without control and here lies the core strength of the Si Compact; a comprehensive but 'simple to use' control surface. Use with Soundcraft ViSi Remote to roam your venue wirelessly adjusting mixes and other audio parameters directly from an iPad! • Security Lockout – Lock the whole console or just select elements, manage the security with the users and profile settings. 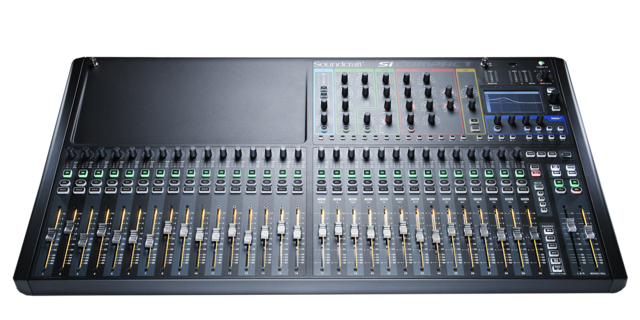 • Assignable Fader Layers – Customise each of the four fader layer pages to meet your needs or add/insert faders to accommodate that additional mic that was not in the patch list! • Copy & Paste – Copy whole channels, buses, mixes, Lexicon(tm) effects, a single part such as the EQ or multiple parts like the channel gate and compressor. • Personal Monitoring Interface – When used with the Si BLU link option card, the Si Compact is a perfect partner to the dbx PMC16 Personal Monitoring System , using simple Cat5 cabling for easy setup. • TOTEM – The One Touch Easy Mix; press a single key to mix to an AUX, FX or Matrix bus, the surface and monitoring instantly reconfigure to allow instant mixing to your chosen bus on the faders. • BSS GEQ – With a BSS GEQ on every bus there is never any need to assign from a pool of resources and you will never 'run out' of processing. • 1 Control = 1 Function – With each control dedicated to a given function there is never any 'layering' of controls or navigating through screens; this allows the Si Compact controls to be labeled on the surface just as they would have been on an analogue mixer. 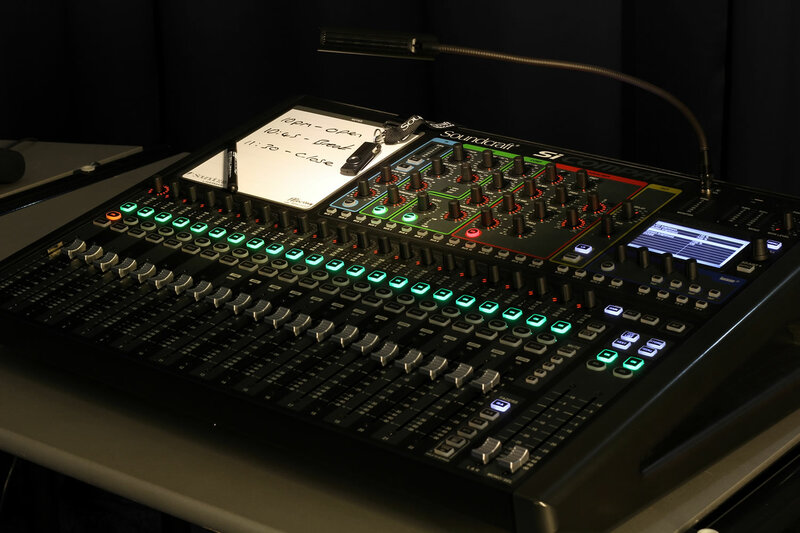 • Global Mode Controls – A row of rotary controls above each fader assignable at the touch of a button to be GAIN, PAN or HPF for all of the inputs allowing instant access to the core functions. 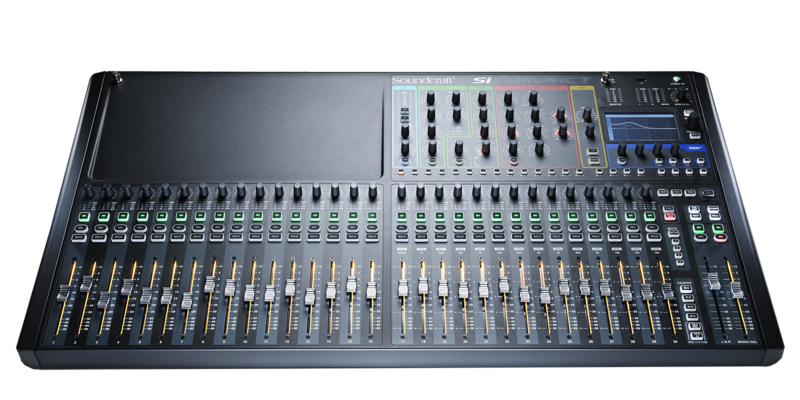 • Soundcraft FaderGlow® – Illuminates the fader slots according to function with clearly defined colours for FX, Stereo, Linked Mono, GEQ, POST Fade Aux, PRE Fade Aux; you'll never be lost again! • Instant Access Keys – Dedicated keys on the front panel for STORE, RECALL, NEXT, MUTE 1-4, TAP TEMPO and more negate the need to dive into screen & context menus.